When tuning your drones to your chanter listen for the beats between the two tones. You want to try and eliminate those beats by either moving your drone slide up or down. Beats are the sound your bagpipe will make when they are out of tune. It kind of sounds like "wha...wha...wha..." and you want to eliminate that "wha" sound so it just sounds like one clear tone. This requires very small moves up and down the drone. 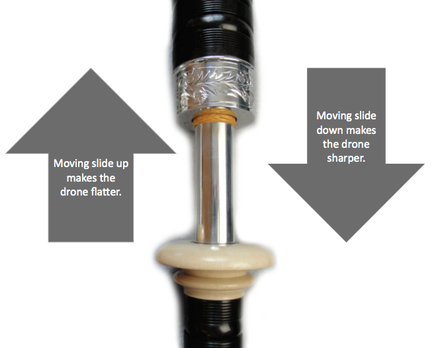 Many beginning pipers will not be sure which way to move the drone "up" or "down" this is something you learn with practice. The easiest way to eliminate this problem when you are starting out is to start with the drone in the highest position and then keep moving it down a little bit at a time until you eliminate the beats and are in tune. If you discover that your tuning is getting worse when you move the drone then you are simply going the wrong way and need to do the opposite. To tune your drones you must must slide the drone up and down. Increasing the length of the drone will make your drones flatter. Decreasing the length of your drones will make them sharper. Begin by giving your chanter reed a little moist squeeze and then play your pipes for about 5 minutes to warm them up with the drones shut off. 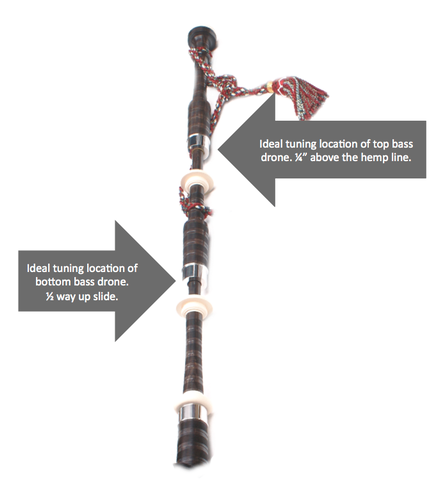 Blow up your bagpipe and play a High A and shut off your inside middle tenor and bass drone by taping the top hole. We use a High A to tune to instead of a Low A because it gives you s free hand to tune with and its the quietest note of the chanter making it easier to hear the beats of the drone. It is also the hardest note to blow steady so it forces you to blow steady. Set your outside drone to the top of the tuning pin and begin to move in down slowly until you believe the note sounds in tune with your High A. Once you believe it is in tune with your High A, try playing a Low A. If it still doesn't sound quite right go back up to High A and move the slide down a little more and then try your Low A again. Once you think your in tune, look at your tuning slide so that you will remember where it is tuning and move the drone down another 1/16" if it sounds worse then move it back up the 1/16" to where you thought was in tune. If at any time you can't seem to find where the drone should be tuning then move it back up again to the top of the tuning pin and start again. Once your in tune continue onto step 2 and don't stop playing. Stick your finger in the top of your middle tenor drone and pull out. This will start the drone sounding. Play a High A and tune your middle tenor drone to match your outside tenor drone. Start at the top of the tuning pin and move down slowly until the beats are gone and there drones sound in tune with each other. Once your in tune continue onto step 3 and don't stop playing. Shut off your middle tenor drone by touching the top of the drone and stick your finger in the top of your bass drone and pull out. Now the middle drone should be off and the outside tenor and the bass should be sounding. 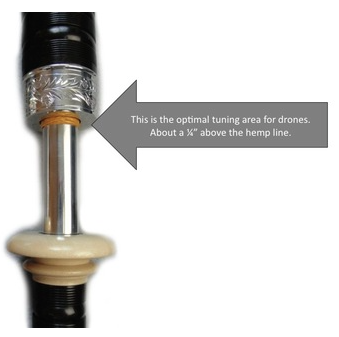 The top tuning slide should be high, where the hemp meets the drone. You will only be moving the lower tuning slide of the bass drone. begin with it high like you did with the tenors and slowly move down till the beats are gone and it sounds in tune with your outside tenor. Start the middle drone up again by sticking your finger in and pulling out. Now all your drones should be in tune. Why is this the ideal running location? The top section of the drones have a larger diameter than the bottom half. This is designed to allow the air from the drone reed to resonate and bounce around the inside walls of the drones. Thus the higher you tune your drones the more room there is for your drones to resonate and achieve a nicer sound. The lower the drones tune the more harsh the drone sound. When the drones are tuning low on the tuning pin it reduces the area in-which they can resonate. Thus, always do your best to manipulate your drone reeds so that the tuning pin looks like it does pictured to the left. If your drones are not tuning 1/4" above the hemp line you will need to adjust your drone reeds. Learn about adjusting your drone reeds here. The exception to this rule is the bottom tuning slide of the base drone which should tune in the middle of the slide, about 3 finger widths. The top section of the bass drone should tune in the same spot as the tenors, 1/4" above the hemp line. Set the top bass section 1/4" above the hemp line and then don't touch it. Use the bottom section to do the fine tuning.